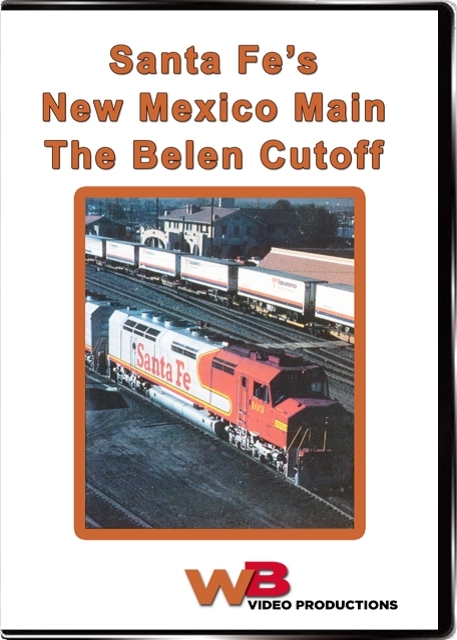 The desolate beauty of Santa Fe's New Mexico mainline over the Belen Cutoff comes alive in this fast-paced program produced by WB Video in 1990. It's non-stop action from Belen, the busy western terminal of the New Mexico division, eastward to the top of the grade at Mountainair and across the high desert to Clovis, New Mexico. At the West End of Abo Canyon, long Santa Fe trains cross the Sias Bridge high above the desert floor. At Mountainair a parade of Santa Fe power thunders past the picturesque south western style depot. The traffic is brisk at Dalies Junction where the Belen Cutoff and the original mainline over Raton and Glorieta Passes merge. See Amtrak's Super Fleet with red and silver Warbonnets in the lead. The older SDF45, SD45 and the GP30's are still very much in evidence. With video by Dave Gross and narration by Rege Cordic, this program captures the excitement of big time, modern railroading in the old west. Marion Charles Mann (Little Mountain SC US) on 2018-09-04 15:56:05.